Congratulations on acquiring your new kitten! This is an exciting time and we have put together some information for you to ensure the best start for your new companion. Once you have brought your kitten home, we advise first booking a Free Kitten Check with one of our veterinary surgeons. During this appointment we can discuss many of the points we raise here in more detail. Introducing your new kitten to your home is an exciting time, but it can be very stressful for your kitten. The following tips from the Feline Advisory Bureau will help you to settle in your new companion. Give your kitten reassurance and time to adjust to her new surroundings before making introductions to other animals in the household. Make sure all the doors and windows are closed and that there is a guard in front of the fireplace (a dark quiet chimney can be very inviting to a nervous kitten). Make sure that he knows where the bed, litter tray and food bowls are. See www.icatcare.org for further great advice. It is a great comfort to know that, should your pet need veterinary attention, you can have assistance with providing the necessary treatment. Once registered at the practice, your kitten will receive 4 weeks FREE insurance with Petplan (with no obligation). We recommend that you then continue this policy with a ‘Life Cover’ plan. This type of policy will cover for accidents, illnesses and any ongoing conditions, which may extend beyond the policy year. Beware of policies that only offer ‘yearly cover’: once the policy year ends, your cat will no longer be covered for the condition being claimed for. Check www.PetPlan.co.uk for more information. This is the biggest influence you can have on your cat’s life long health. Therefore, it is important to use a good quality ‘growth’ diet suitable for your kitten’s breed. A quality brand of complete, dry diet designed for kittens is the best option. Changes to diet must be done gradually to avoid ‘tummy upsets’. We recommend the Hill’s Vet Essential Range and are happy to offer tailored diet advice at your first appointment. From 9 weeks old, your kitten should be vaccinated against Cat Flu, Feline Infectious Enteritis and Feline Leukaemia Virus. These diseases cause serious illness and can be life-threatening or have long term side effects. The initial course consists of 2 injections 3 weeks apart, annual injections are then required to maintain immunity throughout your cat’s life. Roundworms are the initial cause for concern to your kitten as they can be infected through their mother’s milk. Therefore, it is vital that your kitten is wormed correctly to ensure healthy growth and vitality. Long term, it is important to maintain good quality parasite control for Roundworm, Tapeworm, Fleas and Ticks. Please discuss an individual parasite plan with the vet on your first appointment. Products obtained from us are veterinary licensed and have gone through rigorous safety and quality checks. For more information, take a look at www.jungleforpets.co.uk/. This is a small implant with is injected under the skin. The unique chip number is then registered on a database with your contact details. Should your cat become lost, this chip can be read by vets and local councils. Once they are found, you can then be contacted immediately, allowing for a much faster and easier reunion with your pet. 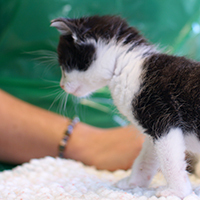 Your kitten can be microchipped at your first Kitten Check. Check www.identichip.co.uk to learn more. This is an important part of responsible cat ownership. Sadly, there are many shelter and stray cats in the UK; it is important that we don’t increase this growing problem. 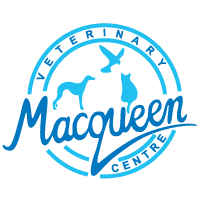 At Macqueens we are happy to follow the current advice of The Cat Group (an eminent opinion leader in Feline Welfare) which, after extensive research, now recommends that cats are neutered earlier than the traditional 6 months. It is now thought to be preferable to neuter as soon as possible after their vaccination course has been completed: when your kitten is 4 months old. This prevents the risk of unwanted pregnancy, avoids the risks of neutering a queen on heat, and minimises the tomcat wanderlust. There are no health benefits for female cats to have a litter first, this is an urban myth. Non-neutered male cats will develop strong-smelling urine on maturity and be more likely to stray and fight. We therefore strongly recommend that your cat is neutered, this can be discussed further at your first appointment. We are listed on the Cat Protection League Early Neutering Register. More information and a video can be found on this website. We understand how quickly your furry friends grow and how important it is to have a beautiful keepsake that captures those special moments. Choose from a wide range of pendants, charms, keyrings and cufflinks in 99.9% pure polished silver with the option of 24ct gold detailing. Each piece is individually commissioned, handmade and unique, creating the perfect gift for every occasion. 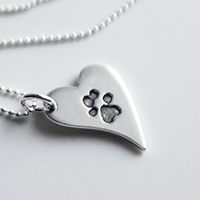 Petite Paw Prints are a Calne-based jewellery design company who specialise in creating bespoke keepsakes for pet owners.